David Hay is a resident of Charleston, S.C., and president/co-founder of Hay Tire Company, Inc. He graduated from the College of Charleston with a Bachelor of Science in Business Administration in 1981 and is a member of Kappa Alpha. Mr. Hay served as Governor Mark Sanford’s appointee to the Board of Trustees from July 2010 to March 2011. He has served multiple terms on the College of Charleston Foundation Board and is past president of the College’s Alumni Association Board. 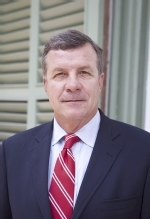 He is a former member of the Charleston Metro Chamber’s Executive Committee and is a past chairman for the Commission of Pilotage for the State of South Carolina. Mr. Hay is married to Mariana Ramsay Hay ’81, owner of Croghan’s Jewel Box on historic King Street in Charleston. They have three children, Kathleen, Mariana, and Mikell.